What with computer problems (a new hard drive waiting to be fitted) and a variety of trips around the country the fishing has been taking a bit of a back seat recently. However, I did have one or two trips to the carp lakes and a spot of fly fishing and plugging in the sea. The carping was moderately successful. I opted to use BIG lumps of floating crust (I thought that I used big baits until I saw the ones that my friend Joe was baiting with). Interestingly even the smaller carp seem keen to take the big lumps of bait and on my first trip (two-and-a-half hours) I hooked six fish and landed three. The biggest one (well in the twenties) came unstuck after ploughing through tons of weed but I landed a fish of nineteen pounds and a couple of smaller ones. 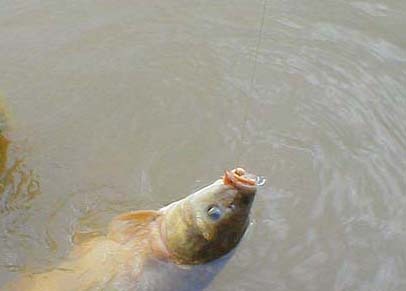 All the fish took boldly and most of them hooked themselves against the bend of the rod without the need for a strike. Perhaps the most interesting session was one of my fly fishing/spinning trips to the coast. Since the hot calm weather finished I have been averaging half-a-dozen fish in my one hour early morning sessions (in the hot calm conditions I often landed about twenty!). Usually there was a good mix of species with mackerel, pollack, scad, garfish and bass taken more or less at random. Most of the bass were on plugs and most of the garfish were on mackerel baits but the other fish normally took flies. On one morning when the sea was a bit rough after catching a few pollack on the fly I decided to try a J13 Rapala which being bigger and diving a bit deeper I thought might produce a better bass. It didn't but after about ten minutes I had a good bite and landed one of the best coloured wrasse I have ever seen. The fish probably solved a problem from an earlier trip too. I had landed two bass on the J13 and after hooking a third one which pulled MUCH harder I lost the plug when the fish grounded me in heavy kelp and rock. 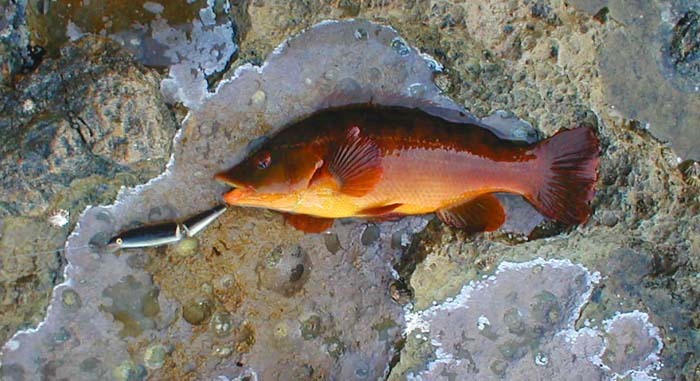 I knew that it was unlikely to have been a bass but after landing the wrasse I am fairly convinced that it must have been a really big ballan. Perhaps it is worth trying with a few hard crabs from the same spot.